The other day, I compared Abraham Maslow’s Hierarchy of Needs to the chakras in Indian philosophy, and I promised to expound a bit on the highest need/chakra, which we might call, to use Maslow’s word, self-actualization. It’s an ugly term, born out of Esalen in the late sixties, when hyphens, Latin roots and the noun form of verbs were considered good things because they bestowed credibility in between naked massages in the Esalen hot tubs which I myself once had to endure as part of my journalistic research. So let’s just call it something else. To self-actualize is–to use the technical Jewish-Buddhist term ;)–to be a Mensch. I consider it perhaps the highest form of success, and it thus becomes relevant in the penultimate chapter of my book. According to Maslow, only about 2% of the human population self-actualizes! In the rest of this post, I want to flesh out what self-actualization might entail, with help from an excellent summary by Dr. C. George Boeree. Take another look at Maslow’s famous pyramid, which I showed you in the previous post on the subject. There is one difference between the top of the pyramid and all the lower rungs. At the bottom (breathing, eating, feeling safe etc), we feel needs only when we lack something. We cease to feel them as soon as we have what we crave. So, if I am suffocating, all I care about is air. But once I have air again and can breathe, the obsession is gone. Maslow called these cravings deficit needs. Self-actualization is different. When we feel that we are fulfilling our potential–by being creative, for example–the need to self-actualize does not go away but grows. Fulfilling our potential makes us feel alive and satisfies us. So Maslow called these motivations being needs to distinguish them from the deficit needs. So what kind of person reaches the highest stage and becomes a Mensch? tended to have “peak experiences“, which we might call episodes of rapture or ecstasy–mystical feelings of merging into an infinitely large and eternal whole. were occasionally ruthless and cold. In short, they were, as Walt Whitman might say, “large”: they contradicted themselves and were fine with that. Frankly, Maslow is a lot of work, and I have been pondering whether it has been worth it. I can’t decide whether the character sketch, and even his hierarcy of needs, is too obvious and thus banal, or whether it is helpful. For now I lean toward the latter. Since I began this meditation by comparing his thoughts to ancient Indian philosophy, let me also conclude that way. It does strike me that self-actualization is strikingly similar to some visions of what “enlightenment” might be like. First, I happen to believe that the yoga taught by Patanjali and his contemporary, the Buddha, leads to fleeting instances of samadhi (enlightenment, ecstasy), rather as it overcame St Teresa, instead of lasting bliss. “Peak experiences,” in other words. Second, the “method” is similar: The simplicity, love of solitude, humor (think of Zen monks), non-conformism, withdrawal and even the occasional coldness of the self-actualizers resembles that of the Eastern yogis and Zen masters. They are really Einsteins in the Lotus position. In short, I think that Maslow’s contribution is to humanize “enlightenment” for us Westerners. PS: After reading these two posts on Abe Maslow, do you think he belongs into my pantheon of the world’s greatest thinkers? 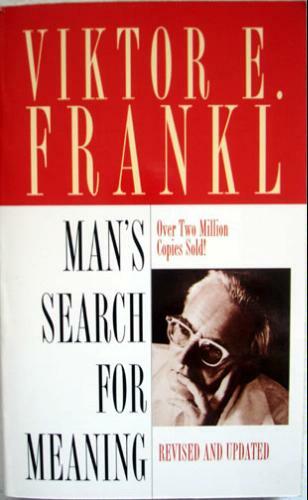 I’ll have much more to say about Viktor Frankl’s book Man’s Search for Meaning, which I recently finished reading. But today just one little story that Frankl, a psychotherapist who survived Auschwitz, tells in the book. Many mysteries explain why triumph and disaster are impostors, which is what my book is about. Here is just one: Success often introduces uncertainty, whereas failure often removes it. And, as researchers are now discovering, people cope far better with disaster than with uncertainty. Jacob Hirsh, a graduate student at the University of Toronto who has studied how different people respond to uncertainty…. found that those considered higher on the neuroticism scale would prefer knowing something for sure – even if it’s negative – than not knowing…. Another psychology professor said that “people who are anxious tend to equate uncertainty with a negative outcome”, even though 85% of the actual outcomes in his studies were neutral or even positive. People also underestimate their ability to deal with bad outcomes. The biggest mistake in psychology is to think that the mind at birth is a blank slate. Instead, “the first draft” has already been written, and will now get revised by experience. In all cultures, liberals tend to value care and fairness most, but largely reject the ingroup, authority and purity as values. Conservatives tend to value them all. Thought-provoking. Other reactions to the talk here and here. I’ve also warned in a previous post about the treacherous first-person voice, which writers overuse, in my opinion, especially in America. Well, James Pennebaker is now forcing me to think much more deeply about all this. He’s a psychology professor at the University of Texas at Austin, and he counts words. All sorts of words, especially the fill words that I thought existed only to be eliminated, and all those Is, mines and mes. Why? Because how people use words, even and especially the ones we think don’t matter, says so much about them. In this post, Pennebaker actually counts how often the candidates use various categories of words. It’s all about probabilities, of course. But I love how Pennebaker reminds me–not that I’m somebody who was likely to forget it–just how much words matter! I think that’s why I’m a storyteller. I take all these disparate events and I have to connect them. I have to make them seem inevitable and yet surprising and plausible. That’s what I think life is like, too. I have the luxury to do exactly what it is we all need time to do, and that is just think about the mystery of life. It’s all about the story, in other words. Human beings remember and understand things only insofar as they learn them in a story. The absence of such a story is what, in my opinion, limits so many non-fiction books. They have an idea or a thesis, but don’t wrap it into a story. So people read until they get the basic idea, then drop the book at page 50. After all, once you “got it”, why waste your time? In my book, I’m trying to do the opposite. It is non-fiction, but true stories can be more suspenseful and surprising than fiction. And there is an idea, but it comes out through the story. This is also my main rebuttal to my mom so far, who worries incessantly that I am giving away too much of my secret sauce in this blog, for some anonymous villain to steal it all. What, I keep thinking, would he (or she) steal? The idea without the story? Good luck. As Allende said, you need the story to get the truth. So, mom, for now I’ll keep blogging. Let me know what I’ve overlooked.